The activities performed in the development of the premature neonatal simulator are research and design cycles to create a basic hard- and software architecture and to design and implement a simulator that enables training for assessment of vital signs ([Peters et al., 2010]). Different prototyping platforms are evaluated ([Peters et al., 2008]) and argumented choices are made for these implementation platforms. Realization of the envisioned simulator will be done in iterative steps. 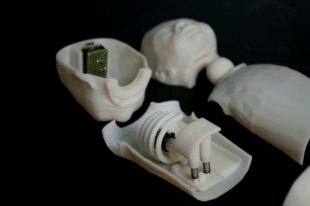 The resulting knowledge and expertise is used to create a prototype able to simulate several important vital signs. Realistic display of clinical signs of a premature. The requirements are derived from the experience of medical staff in handling premature neonates. This also involves taking perception and human action possibilities into account. Interactivity: responses generated using physiological models. The requirements are derived from the way the human organism works for real babies. Note that not only a healthy baby is to be simulated, but also the extremely unhealthy states of a baby that could occur immediately after birth. Can we design a baby-manikin that simulates the specific features of a premature infant? More specifically, can we design those elements of the baby-manikin that enable to assess a baby's vital signs? Can we incorporate physiological models in such a way that the baby manikin responds adequately to treatments? Can we fruitfully deploy contemporary developments such as miniaturization of embedded processors and 3D-printing? At present we have preliminary prototypes that allow simulation of heart and lung sounds, skin colorization, muscle tension and arm movement. 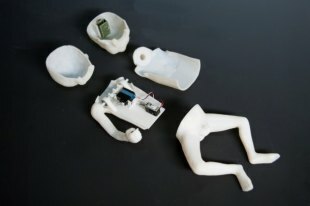 The prototype parts are built at the actual size of a preterm baby and construction parts (the inside mechanics as well as the actual baby-shell) are mainly created using a 3d printer. These prototypes incorporate specifically designed mechanic elements as well as the electronics to simulate the basic vital signs. cybernetics and informatics, WMSCI2008, Orlando, Florida. S. Zhong, Z. Pan, K. Wong and R. Yun, Springer Berlin / Heidelberg. 6249: 235-246.